Virgin Mobile has come out as a total Apple fanboy. Virgin, one of the prepaid arms of Sprint, said at an event in San Francisco on Wednesday that it would stop selling Android phones and exclusively focus on iPhones. To sweeten the deal, Virgin said the first year of unlimited talk, text messages and data will cost $1, and customers will get perks like a free companion ticket for a round-trip flight to the UK on Virgin Atlantic. The service, dubbed Inner Circle, begins Tuesday, but you can preorder phones starting today. The move marks a radical shift for what had been a ho-hum prepaid carrier steamrolled by similar competitors like T-Mobile's MetroPCS and AT&T's Cricket Wireless. By going all-in on iPhones, Virgin Mobile is trying to lift its reputation and go after wealthier customers. The move also gets Virgin Mobile into Apple's retail stores, the first time a prepaid carrier has had a presence there. Virgin's $1 offer is less jaw-dropping after parent Sprint offered a year of free service. But the key difference is the Sprint offer is a low-key, limited experiment, while Virgin's deal is the new norm, according to Dow Draper, CEO of Virgin Mobile USA. "It's not often as a brand you get a chance to reposition yourself," he said in an interview Tuesday. "We know you gotta have a compelling offer." o qualify for the service, you need to buy an iPhone from an Apple store or through the Virgin Mobile site. After the year is up, the service reverts to $50 a month. After two years of service, Virgin will offer six months for $1 if customers buy a new iPhone. The iPhone-only model could be an impediment to many of Virgin's traditionally budget-conscious customers. The iPhone SE starts at $279, while the cheapest phone previously available at Virgin was an $80 LG phone (which ended up being $50 with a discount). In the fall, Virgin will begin selling used iPhones that range from $199 to $449, Draper said. Virgin's national retail partners will continue to sell Android phones under an existing agreement, but Draper said he's working to phase that out. Sprint's "free" offer did include a number of fees, and Virgin's is no different. The $1 annual fee is broken up into 12 monthly payments, and there's a tax on that amount. In addition, customers are responsible for local, state and federal taxes typically associated with phone service. "Our offer of iPhone combined with perks from a host of companies in the Virgin family plus Virgin's world-famous service and great value will be irresistible for our members," Richard Branson, founder of the Virgin Group, said in a statement. Much like the Sprint offer, Virgin is able to afford to give away its service for $1 because it's cutting several costs out of the business. By relying only on Apple's retail presence and its own website, it doesn't have to deal with the cost of staff. There's no need for phone subsidies, since customers need to buy their own iPhone. Unlike other prepaid services, Virgin's unlimited data falls in line with Sprint's offer, which means full 4G LTE speeds till a customer hits 23 gigabytes and a congested network. "We tried to make this as gimmick-free and hassle-free as possible," Draper said. Virgin's $50 unlimited data offer is $10 cheaper than Sprint, and lower than the rest of the industry. It's that low price that has Draper willing to bet that customers will stick around after the first year. One of the reasons he decided to go all-in on iPhone was because Apple users tend to be more loyal. The offer is available to both new and existing Virgin customers, but those who wish to stick with their old plan can do so, Draper said. If you were looking for prepaid wireless service, you probably weren't looking in Virgin's direction. Draper described Virgin Mobile's business as "ho-hum," and as the rest of the Virgin business evolved, mobile was stuck in a rut. In addition to Virgin, Sprint's other prepaid arm is Boost Mobile. "This was not a long term, sustainable position for the brand," Draper said about the old Virgin. That's when he got Virgin's Branson and Apple involved. 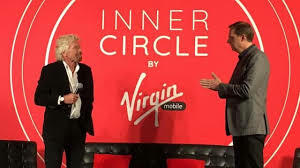 "The new Inner Circle offer is a fun idea, and Virgin Mobile customers are going to love having the best, most advanced iPhones ever," Philip Schiller, head of marketing at Apple, said in a statement.